Across the nation, approximately 40% of freshman abandon college before earning a degree. JWU’s new Talent Advancement Program identifies those students most at risk of dropping out for an initiative that tips the odds in their favor. Rebecca Yearwood-Stinchcomb’s first real culture shock after moving to Johnson & Wales University’s North Miami Campus hit when she saw the jam-packed buses rolling down Biscayne Boulevard. “I’d never even ridden a bus before. We don’t even have taxis or cabs in my hometown. You just walk everywhere or ride your bike,” says the gregarious 19-year-old native of Mount Dora, a farming town of 12,000 people in central Florida. That wasn’t the end of Yearwood-Stinchcomb’s bumpy adjustment to her new life in a booming metropolis of 2.6 million. She marveled at the diverse mix of cultures and languages among her classmates. She was dazed by the responsibility of balancing class schedules and meeting assignments. And she missed the simplicity of her hometown. Given all those challenges, Yearwood-Stinchcomb '19 might easily have become one of the roughly 40% of incoming freshmen nationwide who leave college before earning a degree. But she had an advantage custom-designed to keep students like her on track at Johnson & Wales: the school’s new Talent Advancement Program. 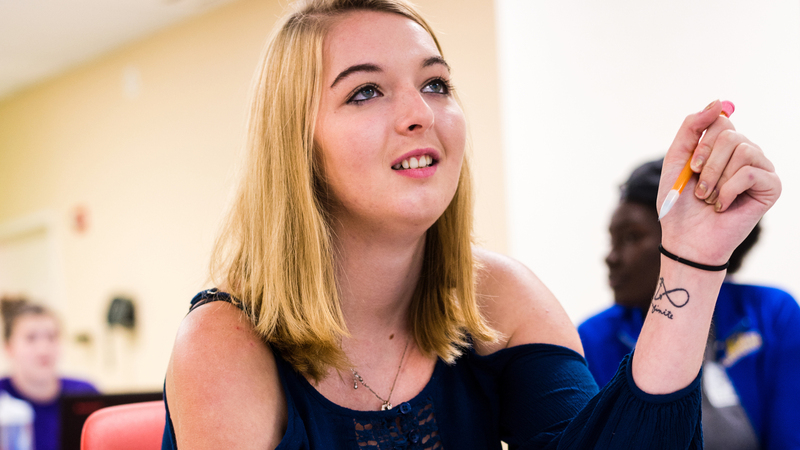 The program, which debuted on the North Miami Campus during the 2015–16 school year, offers an innovative approach to an age-old problem for college administrators: When students come from a dizzying array of backgrounds and with varying degrees of preparation, how can schools create a one-size fits all program to keep them on track? TAP, as the program is colloquially called, starts by tossing the idea of a uniform approach to such a complex challenge. Instead, it identifies incoming students most at risk of dropping out and then marries a weekly class focused on personal development with campus activities that build an affinity for the JWU experience. The end goal? Making college work for the students most likely to be challenged by their new campus life. Rice’s own personal journey played a key role in TAP’s creation. Born and raised in rural South Carolina between Columbia and Spartanburg, Rice was the first in his family to attend college when he enrolled at the JWU Charleston Campus in the late ’80s. He soon realized that his experience as a college student differed greatly from many of his classmates. “I had a single parent and I was highly dependent on student loans, so I had to work while I was in school to pay those loans,” Rice says. That meant making hard decisions. While other students dedicated themselves full time to class and drove around town in their own cars, Rice took the bus or sometimes walked an hour and a half to class. He had to balance a job with his studies. Rice persevered, though, graduating and then managing a restaurant in Hilton Head, South Carolina, before moving to Florida to start his own private catering business and later earning bachelor and master’s degrees at Florida International University and a doctorate at Nova Southeastern University. By the time he returned to Johnson & Wales in 1993 as a faculty member, he’d long since realized that his difficult experience was far from unique. In fact, a high percentage of Johnson & Wales students — particularly at the North Miami Campus — come from nontraditional college backgrounds. Many, like Rice, are the first in their families to attend college. Many others come from immigrant families. Rice wanted to build a program that helped students celebrate those facts, rather than viewing them as obstacles. But how to foster that sense of community while also helping students adjust to the new challenges of college life? Rice and a committee of administrators began meeting in 2014 to try to answer those questions with a new program, which soon became TAP. Instead, Rice and his colleagues designed a flexible, holistic program that starts on day one of school and stays with students throughout their time at Johnson & Wales. TAP begins with administrators analyzing the backgrounds of incoming students to find those most likely to benefit based on their academic record and personal story. During their first term, those students then take a reduced course load and enroll in a TAP-specific class that meets twice a week for two hours at a time. That class hones in on teaching 8 principles — from accepting personal responsibility to learning self-management to developing emotional intelligence — that all aim to foster success in the classroom. The program doesn’t end after that first term; throughout their time at Johnson & Wales, TAP students meet regularly and continue their work. Once the program was developed, Rice brought on Stella Napoles, PsyD, a clinical psychologist, to teach the curriculum to the 135 incoming freshmen last fall who met the new TAP criteria. Napoles says TAP made intuitive sense to her once she learned about the concept. Napoles’ class is just the first piece of the TAP puzzle, though. When Rice and his team developed TAP, they didn’t simply want to teach students how to succeed — they also wanted to find a way to make them a part of campus life. So TAP students are also given a series of student engagement activities — from field trips around town to culinary events — to meet classmates and grow bonds on campus. Lastly, TAP also directly connects students to faculty members and encourages them to ask for help or stop by for advice whenever they need it. For the 135 students who constituted JWU’s first-ever TAP class, the program became more than a class — it became a mark of pride. That was certainly the case for Abraham Baullosa III ’17. 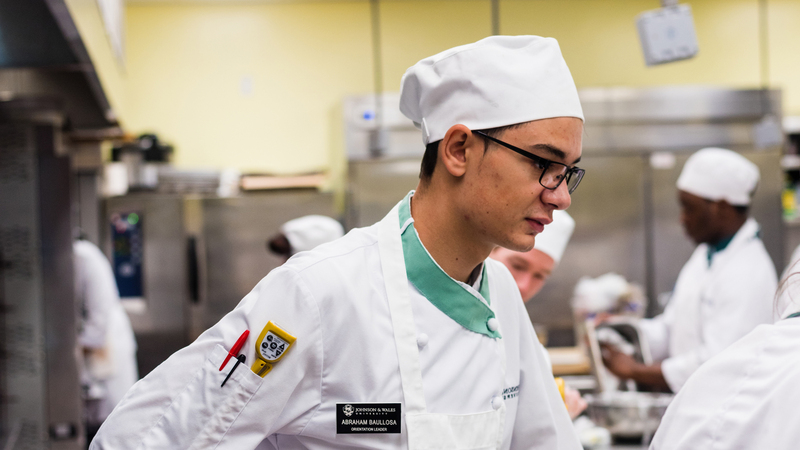 The baking and pastry student had no doubts about his chosen field (at age 5, he dressed up as Emeril Lagasse for Halloween), but he was anxious about the social aspects of college. How would he fit in, especially as a Midwesterner? Would he stay afloat without the support system of friends and family back in Indiana? “TAP enabled me to get a foundation group of friends and a mentor, plus we were engaged in activities around campus and the community,” says Baullosa. Creating and documenting weekly goals was transformative. “When I’d look at the list later and think, ‘I actually accomplished that goal,’ it boosted my self-esteem. One objective I set is to graduate with a 3.8 GPA or higher. TAP helps me focus on academics because it helps me plan my career; in high school I wasn’t really motivated academically. VIDEO: How Has TAP Impacted Your JWU Experience? TAP taught me if you want that A, you have to go get that A. TAP was invaluable to Yearwood-Stinchcomb as well. For the central Floridian, an education at Johnson & Wales is the fulfillment of a dream. When she was twelve, Yearwood-Stinchcomb had already plotted out her life’s course. “I was making banana bread with my grandma and I was like, ‘This is really fun. I really like this.’ Every year, I would make more and more for our family and eventually I said, ‘I’d really like to do this for a living,’ ” she recalls. But moving to Miami was a big jump from Mount Dora and in hindsight, Yearwood-Stinchcomb admits that “I wasn’t ready.” Luckily, she says, TAP soon gave her the tools to adapt to her new life — particularly its focus on time management. As Yearwood-Stinchcomb and her classmates move on to their second year, a new batch of freshmen started TAP this fall. JWU’s Charlotte Campus looks to adopt the program in 2018, and Rice says TAP may expand to other campuses in the near future. “The TAP program has allowed our staff and faculty to put on a different set of lenses where we can see much more clearly the struggle of these students,” says Rice. 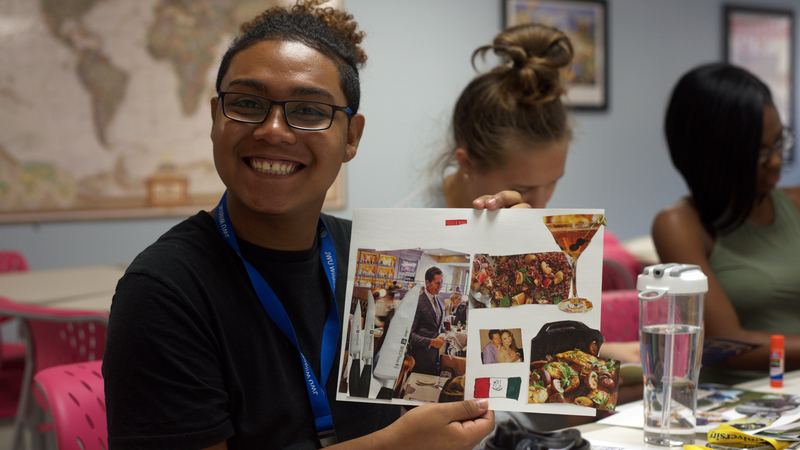 “We can understand cultural differences at a higher level, we can understand the impact that different socioeconomic backgrounds can have and that being the first in family to attend college can have. What TAP is really doing is empowering these students to succeed in life. TAP photos by Karli Evans.